One of the big events at Caravansary is going to happen at Embrace, an 80-foot high statue of two figures embracing. 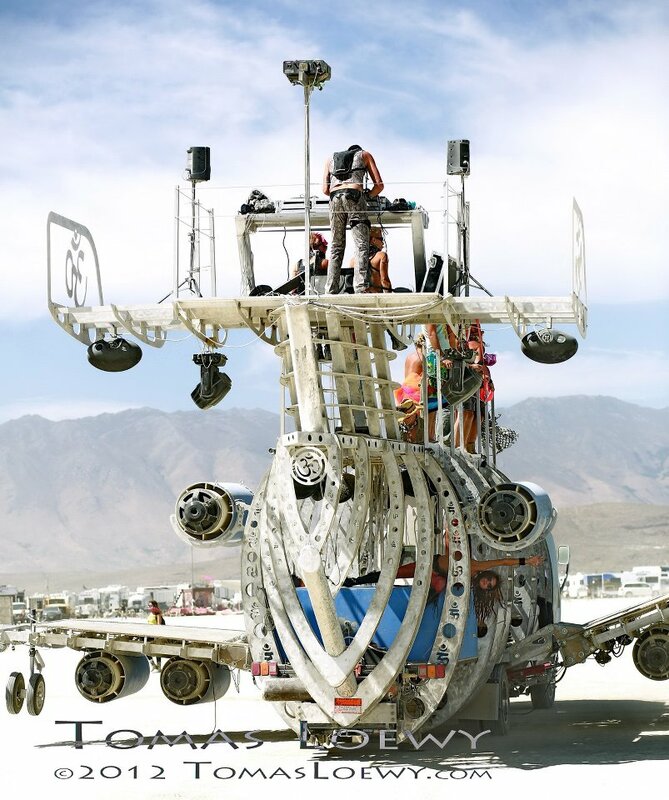 Dancetronauts are organizing “Deep Space Embrace”, which promises to be one of the biggest gatherings of art cars at the annual Black Rock Desert event. It starts at 2100 on August 28th (Thursday) and runs til 0300 August 29th. Please let us know if you are bringing an Art Car to the Deep Space Embrace party that isn’t listed yet and we will update. Dancetronauts will be releasing an album soon. 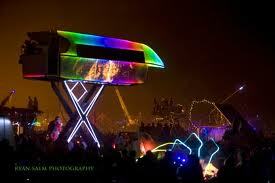 The Dancetronauts’ Strip Ship and Bass Station will be parked for an open playa dance party hosted at Embrace–80’ tall lovers locked in eternal love. What better way to live, love, laugh and dance than at this epic party towered by a symbolic art installation and surrounded by over 35 of your favorite mutant vehicles with additional sound and fire effects! The Bass Station lineup will include resident Dancetronaut DJs and several special guests. The evening will feature fire dancing and performances by our breath-taking bass kittens–the Dancetrohotties! Among several other fire troops. Immerse yourself in good vibes and deep BASS! Special thanks to our friends at the Pier Group for so graciously lending us their massive and beautiful art installation and allowing us to throw their official EMBRACE camp/team party! Art cars and fire dancers interested in participating are encouraged to register. Registration is not mandatory, but will help us with placement and sound. Do you want your art car added to this list? Join our party! And link up with our massive sound! 35 vehicles? Fantastic. Like food trucks, but with dancing. If you can’t find Embrace, an 80 foot high structure of two figures embracing (surrounded by 40 art cars), then you weren’t meant to go.